Amber Reed is 25 years old. 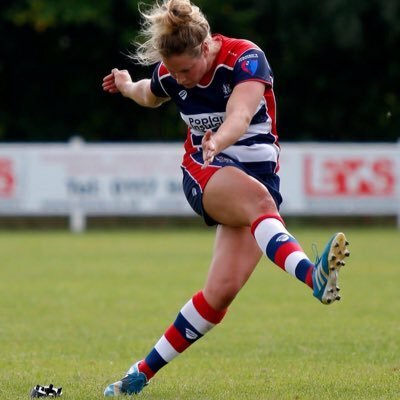 She was a PE teacher and is now a full time rugby player. 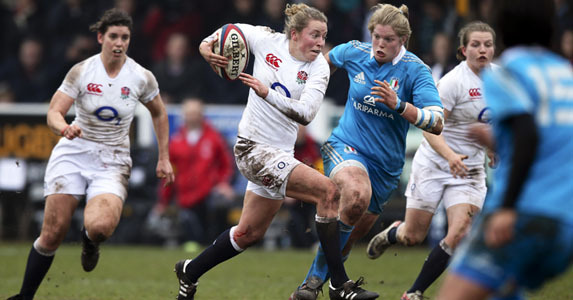 She has won a World Cup and has JUST won a 6 Nations Championship Grand Slam. Her uncle is a former Scotland International and British Lions Lock forward. 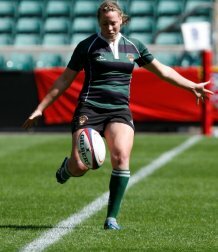 Amber is a versatile fly half and centre who has become one of the strongest players in the World. 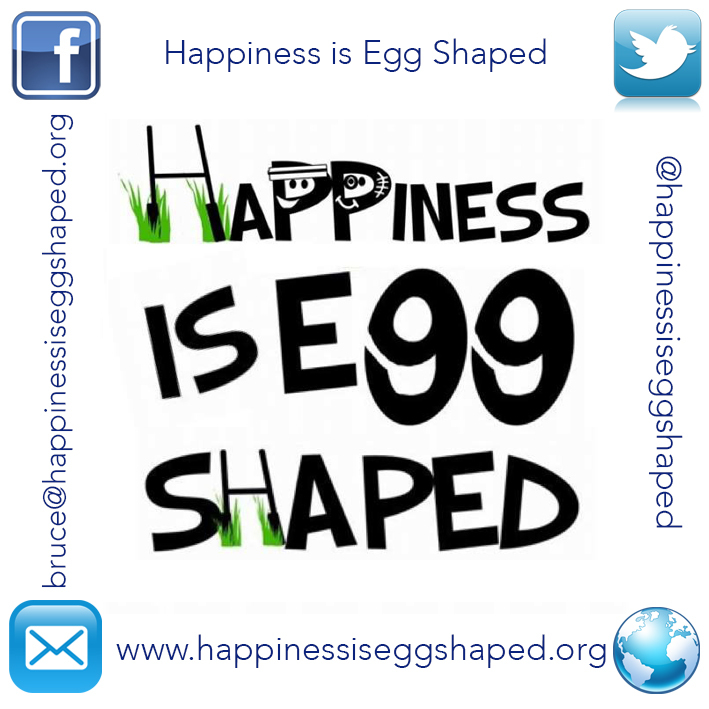 Happiness is Egg Shaped was delighted when Amber took time to answer some questions! You have played many sports (to a good level too!) Why rugby? Who were your role models when you were younger? My biggest influence was my first rugby coach, Ben Berry, age 14 at Colston’s School. The school has a big rugby tradition and we wanted to have a girls’ team that could be part of that history and create a legacy. We used to play at lunchtimes to prepare for tournaments in the Spring term and managed to win Rosslyn Park 7s in 2006 and 2007. We were also runners-up in 2008 and 2009. It was after this time I had well and truly caught the egg-shaped bug! Laura Keates (England), Katie Mason (England) and Gemma Rowland (Wales) have also gone on to achieve International honours from that team. What happened and who encouraged you to give rugby your total commitment? After leaving school I decided rugby was the path I wanted to follow, so I chose to apply for the University of Exeter where I met some fantastic teammates and my love of the game grew. I feel honoured to have represented EUWRFC for 3 years and during that time gain my first Senior International Cap v France (3rd November 2012). The support I received from the University encouraged me to challenge myself and make the most of opportunities. In addition, I was very lucky to have amazing coaches (Mark, Jo & Keith) during this time. Jo Yapp taught me a lot about the game; I have huge respect for her as a player, former England Captain and coach. My family have always been incredibly supportive of the decisions I’ve made and they have never pushed me into anything. Although I think it would made my Grandma’s decision on who to support when we play Scotland a lot easier! 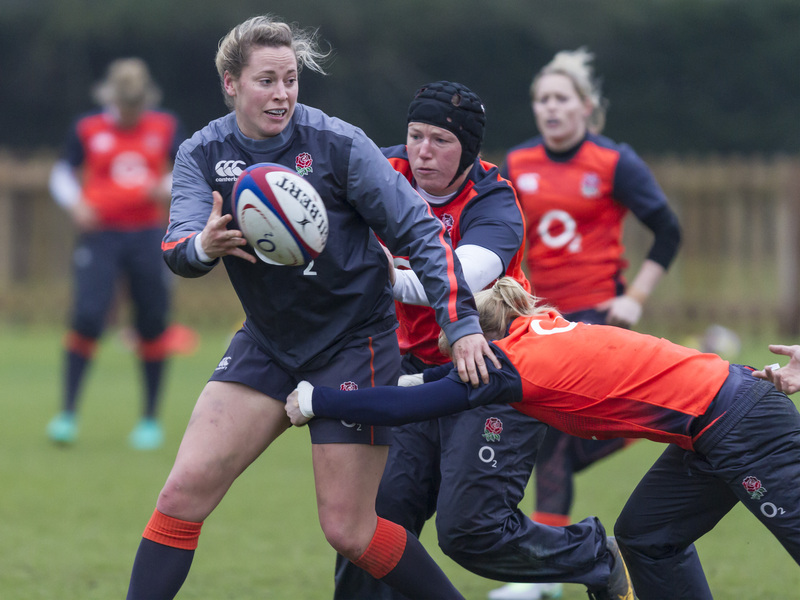 What challenges have you faced in your rugby career and how did you overcome them? It is always better to talk to someone: it’s not a sign of weakness but your inner strength to admit when you need help to be the best you can be. Winning the World Cup is an immense achievement. What do you remember most fondly about the tournament? The most prominent memory I have is being stood on the pitch after the final game waiting to go onto the podium. It was an incredibly surreal experience. I felt as though everything was happening in slow-motion and that I was watching it rather than being there myself. The future is bright for the women’s game. What has it been like becoming a professional and how do you think this has inspired women and girls to start playing or take it more seriously? It sounds a bit of a cliché but it has been a dream come true and I feel very honoured to have this opportunity. All the players I have had the chance to play with over the years have always had a professional outlook on the game and towards training but having it is a job makes it a lot easier. This essentially allows you to train at the same high intensity but you have the benefit of being able to recover. The RFU are really trying to drive the women’s game forwards both at an International and domestic level with the new Women’s Super Rugby competition that will start this September. I believe this will provide young aspiring players with a stepping stone to develop their skills and push for international honours. The prospect of contracts and playing rugby as a career path offers a goal for players to strive towards. How do you relax away from rugby? I’ve recently taken up the ukulele after receiving one as a Christmas present from one of my friends. It has been one of my favourite presents ever and is keeping me occupied at the moment. Outside of camp I also love to head to the beach when I can; I love to surf. It’s a great way to relax and switch off. As a PE teacher, what is your favourite activity to teach and why? I love teaching activities that have a little bit of chaos which are slightly different from the norm. They require multiple skills, such as; spatial awareness, communication and team work in addition to functional movement skills. All these attributes are vital for any child’s development. If you could invite any person to come into your PE class to inspire the kids, who would it be and why? It would be someone like Matt Hampson or Henry Fraser. They are incredible role models with an immensely positive outlook on life. They’ve taken their unfortunate situation and used that to change the lives of others and inspired them to achieve the things in life that make them happy. My family have been a massive inspiration for me throughout my life. I see them as role models with the things they have achieved in their lives. They have been / are always there for me no matter what and I want to be the best version of me so I can make them proud. I see it as a way of giving something back to them as a thank you for everything they’ve done for me over the years. If you could score a try on any pitch in the world, where would it be and who would be the opposition? Scoring a try against New Zealand at Twickenham would be incredible as we have a competitive rivalry against then and it is always a special stadium to play at. Which of your team mates is the funniest and what do they do to make you laugh? My roomie, Izzy Noel-Smith, as we have a similar sense of humour! She generally makes me laugh with film quotations or by randomly bursting out into song. Yes – happiness is not a goal; it’s a by product. The future is bright for the Women’s game and there is no doubt, the future is very bright for Amber Reed. THIS Girl DEFINITELY CAN.